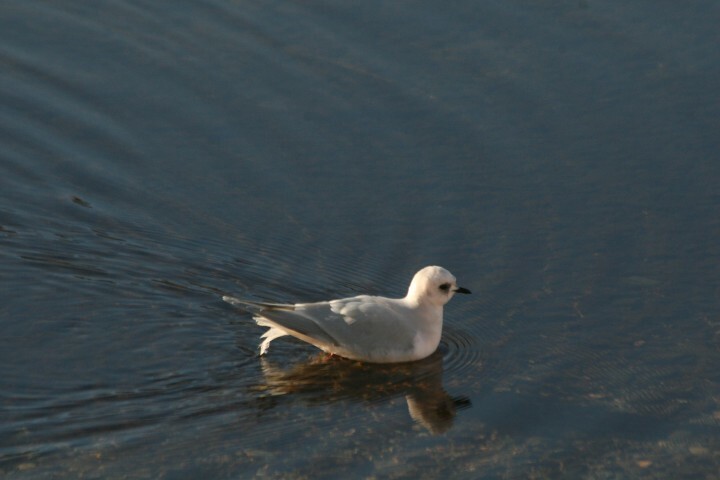 Ross’s Gull in Okanogan County! 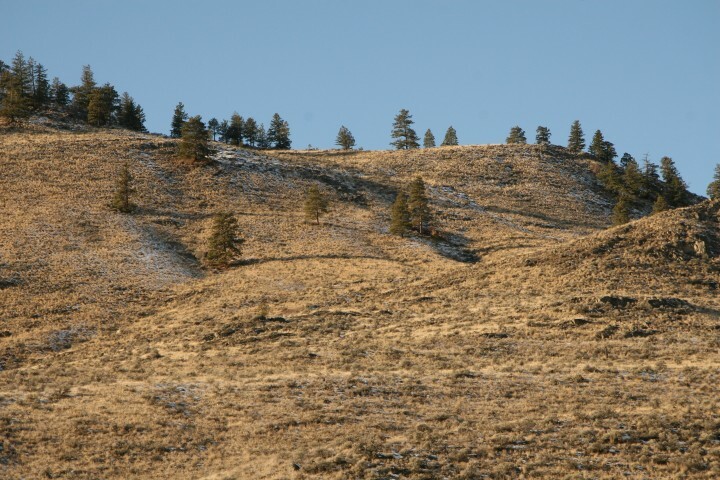 Yesterday I took part in the Cawston Christmas Bird count, covering the Lower Similkameen Indian Reserve, one of the most beautiful spots in southern British Columbia. At one point I stood at the old Chopaka border crossing (now a locked gate with a polite sign from Homeland Security outlining what evils would befall you and your possessions if you even thought about hopping over the barbed wire fence) with Tracy Lawlor, the environmental coordinator for the Lower Similkameen Indian Band, and Guy Wilson, a mutual friend of Tracy and mine from Naramata. There weren’t many birds around there, and as I took in the glorious river bottom woodlands backed by the snow-capped crags of Mount Chopaka, little did I realize what amazing bird was only 7 miles to the south at Palmer Lake in northern Washington State. As darkness fell, we made our way to Marilyn and Bob Bergen’s place in Cawston for the count-up dinner. As we wolfed down lasagna and garlic toast, my son Russell got a message from his friend Ryan Merrill of Seattle. “Ross’s Gull at Palmer Lake”, he calmly announced to the table of birders. So close and yet so far. It was obviously too late to look for the bird that day, and as we drove home it began to look like we might never get down there. We hit a major blizzard in Keremeos and crawled home on the highway to Penticton, unable to see where the road was most of the time. I was feeling like I’d been hit with a major flu bug, then Russell remembered he’d left his passport in Vancouver. The Similkameen Valley through Shanker’s Bend was an endless series of postcard-perfect scenes—the winding river, the high cliffs and blue blue sky. Our plan on reaching Palmer Lake was to look for birders—there would surely be some there after the alarm was raised on the coast, since this was only the second record for Washington. Sure enough, as we approached the south end of the lake, there was a cluster of three cars and a bunch of scope-toting people showing all the field marks of serious birders. One turned out to be Charlie Wright, a Facebook friend I’d never met. They directed us to the bird right away, pointing at a deer carcass on the lakeshore. 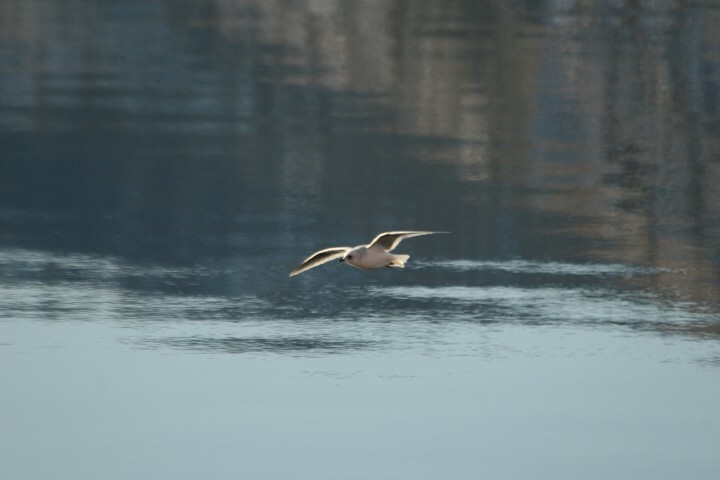 Pecking at the carcass was a tiny, dove-like gull, solid gray on the mantle and distinctly pinkish below. This was the holy grail of many birders—one of the rarest and most enigmatic species on the continent. We watched it quietly as it fed, then saw it fly out over the lake, briefly preening, then returning for another course of deer meat. At one point two locals stopped with binoculars. “I heard about the bird and wanted to show it to Daddy” said the man. Daddy looked at the gull and said, disappointed “It just looks like a bird—I thought it would be bigger.” Eventually the gull flew down the beach a short distance and began a prolonged period of preening and resting, so we took our leave and drove north to the border. This time we crossed at the “new” Chopaka customs station just north of Nighthawk, Washington. The Canadian border guard wanted to know more about the gull, since he’d already had some birders go through telling him why they had only crossed the border to see a bird. We asked if we could poke around in the sagebrush at the border to look for Gray Partridge, and he said that would be fine, but stay at least 100 metres away from the actual fenceline. We did go for a bit of a walk there and saw some partridge-like tracks, but no birds flushed from the sage. Ah well, we’d seen a Ross’s Gull today—nothing much could be finer. I guess it would have been nice to see it in the Canadian Okanagan, but it’s always good to have an excuse to cross that border on a beautiful day. Still a litttle amazed at the hype generated by one small bird eating on a dead deer. I’ve never been around people so focused on birds. We live on Spectacle Lake 656b Loomis/Oroville Rd. Stop by if you are going by.